If you work with load balancers, you’ve probably heard the term “controller” lately. Enterprises have had to significantly increase their load balancer footprint to keep up with the growing number of applications. The controller is the way to automate the management and lifecycle of load balancers across data centers and clouds. But here’s the problem, load balancing vendors like F5 Networks, Citrix, and NGINX do not have a controller. They have an instance manager. Let’s explore the difference. The world is ablaze with Marie Kondo and her KonMari Method™. Her book, The Life-Changing Magic of Tidying Up, and her Netflix series have impacted the lives of millions around the globe. Marie Kondo's method starts with a simple question: “Does it spark joy?” If a particular item sparks joy, keep it. If not, part ways with it. The start of a New Year serves as a great reminder to re-evaluate objectives, initiatives, and technologies. As we move forward into 2019, it is important to leave the past in the past and begin building towards the future. And appliance load balancers are something enterprises need to say “goodbye” to ASAP — and for good reason! 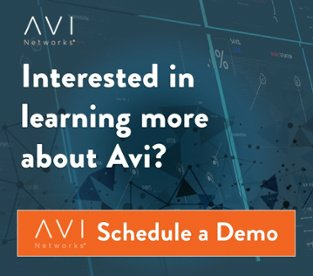 Today, Avi Networks announced plans to integrate with Istio to create a Universal Service Mesh that spans traditional and containerized applications on cloud, VM, and bare-metal infrastructure. Why encrypt with SSL/TLS in the first place? This is like asking why use car seats. It might be obvious now but just a few decades ago, it wasn’t uncommon for a group of unbuckled kids to be piled in the back of a car or truck (this would be a nightmare for parents today). Last year, I had a bit of fun defending hardware appliances with my article Avi vs. F5: 9 Reasons Why Hardware is Better than Software. If you couldn’t tell, sarcasm is my first language. In the last couple of years, we have seen a rapid shift in application architecture to a distributed microservices architecture—where monolithic and a bulky applications are decomposed into smaller individual services that can be independently changed, built, deployed and managed. Avi Vantage provides enterprise grade load balancing for container ecosystems like Kubernetes. To install Avi on Kubernetes, a Cloud needs to be configured on the Avi controller, which allows it to run APIs to the Kubernetes master to automate service discovery and load balancing. Today, we are excited to announce the launch of Avi SaaS, a cloud managed solution to deliver Avi's load balancing, WAF, GSLB, and service mesh across multi-cloud environments.